TS EAMCET Syllabus 2019 Pdf: Candidates aiming to take admission in the engineering, agriculture or medical colleges of Telangana state can apply for TS EAMCET 2019. To get good marks in this entrance exam, you will need to check the complete TS EAMCET exam syllabus and Exam Pattern also. The syllabus will be comprised of intermediate level subjects. 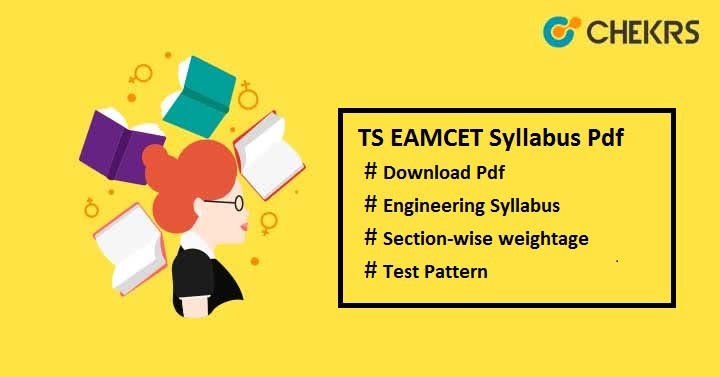 If you are looking for the TS EAMCET Syllabus Pdf Download link, then you are at right place because here we have provided the important topics including the download link also. Scroll down the page to check the Engineering as well as Agriculture & Medical syllabus at the same platform. To get familiar with the original question paper, candidates should check the Telangana EAMCET Exam Pattern before appearing for the exam. It will give you idea about the mode of exam, paper pattern, time duration, marking scheme, paper language etc. If you are applying for agriculture or medical stream then there will be 40 questions from each part in paper such as Zoology-40, Botany-40, Physics-40, and Chemistry -40. Once the syllabus is completed you should give online mock test if possible or you can practice Previous Year Papers also. It will help you to learn to manage the time to complete the exam. You can focus on your weak point also. If there is any doubt, we are here to help you. Send your query in the message box below. We will respond you soon.